Benjamin Graham taught that Intelligent Investors must do a thorough fundamental analysis of investment opportunities to determine their intrinsic value and inherent risk. This is best done by utilizing a systematic approach to analysis that will provide investors with a sense of how a specific company compares to another company or by reviewing the 10 Stocks for Using A Benjamin Graham Value Investing Strategy – March 2017. By using the ModernGraham method one can review a company’s historical accomplishments and determine an intrinsic value that can be compared across industries. 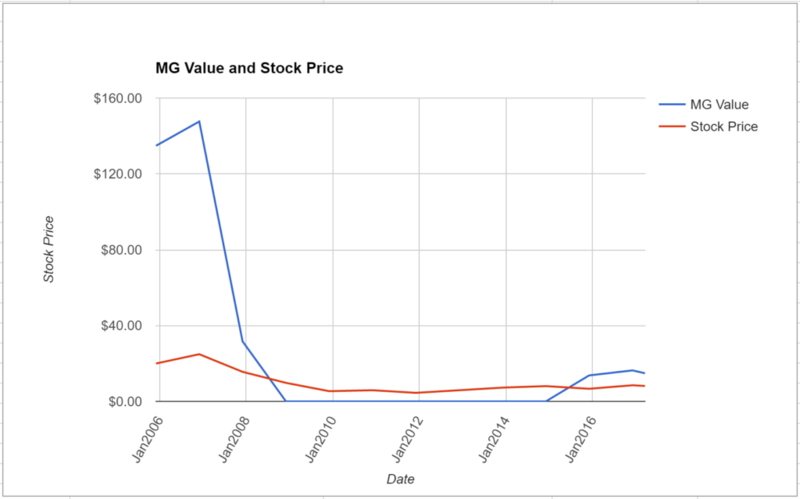 What follows is a stock analysis showing a specific look at how Cousins Properties Inc (CUZ) fares in the ModernGraham valuation model. Company Profile (obtained from Google Finance): Cousins Properties Incorporated is a self-administered and self-managed real estate investment trust. The Company’s segments include Office, Mixed-Use, Other, Atlanta, Austin, Charlotte, Orlando, Tampa, Phoenix and Other. It develops, acquires, leases, manages and owns primarily Class A office properties and opportunistic mixed-use developments in Sunbelt markets with a focus on Georgia, Texas and North Carolina. It manages a 15.8 million-square-foot trophy office portfolio in the Sun Belt markets of Atlanta, Austin, Charlotte, Orlando, Tampa and Tempe. As of December 31, 2016, its portfolio of real estate assets consisted of interests in 16.2 million square feet of office space and 786,000 square feet of mixed-use space. The Company, through Cousins TRS Services LLC, owns and manages its own real estate portfolio and performs certain real estate related services for other parties. Its properties include Colorado Tower, 816 Congress, Emory Point Apartments and Emory Point Retail. Cousins Properties Inc does not satisfy the requirements of either the Enterprising Investor or the more conservative Defensive Investor. The Defensive Investor is concerned with the low current ratio, insufficient earnings stability over the last ten years, and the high PEmg ratio. The Enterprising Investor has concerns regarding the level of debt relative to the current assets. As a result, all value investors following the ModernGraham approach should explore other opportunities at this time or proceed cautiously with a speculative attitude. As for a valuation, the company appears to be Undervalued after growing its EPSmg (normalized earnings) from $0.05 in 2013 to an estimated $0.39 for 2017. 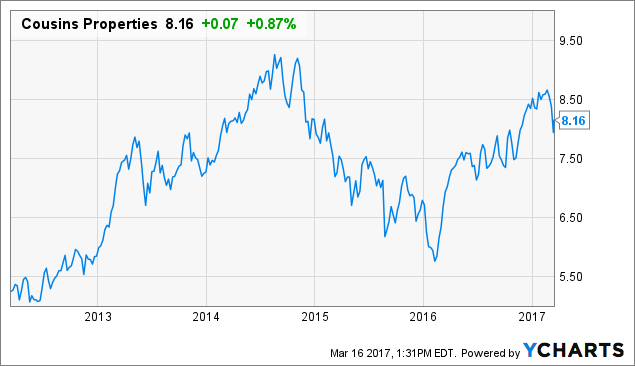 This level of demonstrated earnings growth outpaces the market’s implied estimate of 6.33% annual earnings growth over the next 7-10 years. As a result, the ModernGraham valuation model, based on the Benjamin Graham value investing formula, returns an estimate of intrinsic value above the price. At the time of valuation, further research into Cousins Properties Inc revealed the company was trading above its Graham Number of $6.69. The company pays a dividend of $0.32 per share, for a yield of 3.9%, putting it among the best dividend paying stocks today. 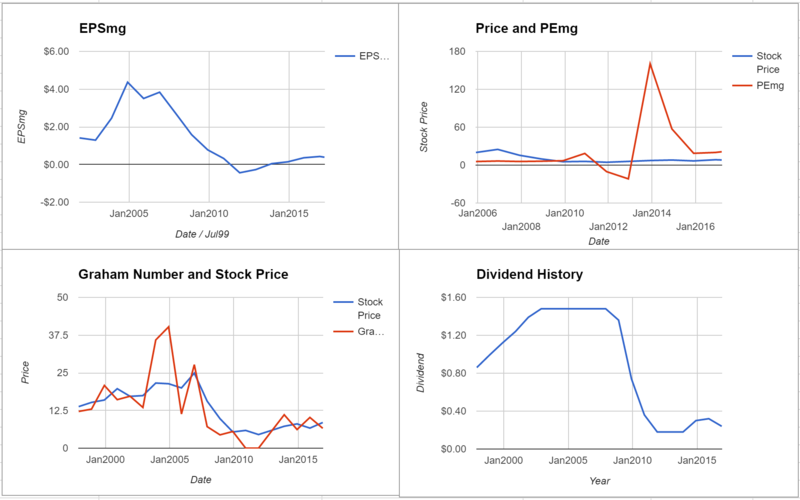 Its PEmg (price over earnings per share – ModernGraham) was 21.15, which was below the industry average of 31.91, which by some methods of valuation makes it one of the most undervalued stocks in its industry. Finally, the company was trading above its Net Current Asset Value (NCAV) of $-6.24. Cousins Properties Inc receives an average overall rating in the ModernGraham grading system, scoring a C.